Row 2: Ch 5 (counts as a dc and a ch-2 sp); 2 dc in 5th Sc; *sk next st, dc in next st, sk next st, 2 dc in next st; rep from * ending, sk next st, dc in last st. Ch1. Do not turn. Note: Following row is worked from left to right. Row 3: With RS facing, ch 1, sk first dc; *working around post of next dc of previous row, work (2 dc, 2 hdc, 2 sc, ch 3, sl st on 3rd ch from hook), working around post of next dc to right (2 sc, 2 hdc, 2 dc) sc in next single dc-1 petal made; rep from * 4 more times; sl st to beg ch 1 and fasten off. With hand-sewing nee­dle and thread, gather first row tightly into ring and secure. Rnd 4: Join black to any st of Row 1 (outer edge), ch 1, sc in same st; *1 sc, ch 3, sl st in 3rd ch from hook, 2 sc; rep from * around; join in first sl st.
Fasten off and weave in ends. 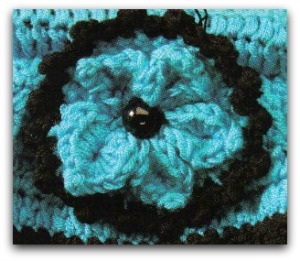 Sew button to center of flower. Note: Piece has 4 ruffle sections. With larger hook, ch 28. Row 2: Ch 3 (counts as a dc on this and following rows), dc in each rem dc and in 3rd ch of beg 3 skipped chs, turn. Row 3: Ch 3, dc in each rem dc and in 3rd ch of turning ch-3. Fasten off. Row 2: Ch 3, dc in each rem dc, turn. Row 3: Rep Row 2. Row 4: Ch 3, dc in each rem dc, turn. 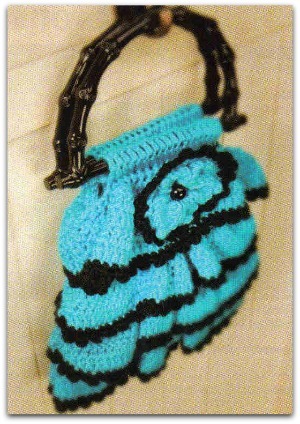 Note for this crochet purse pattern: For sc dec, draw up 1p in next 2 sts indicated, yo and draw through all 3 1ps on hook. Row 6: Hold pieces tog with bottom piece in front and ruffle at back of work; ch 1, working through both pieces at same time, sc in each st, turn. Row 7: Ch 3, dc in each rem dc, turn. Rows 8 & 9: Rep row 7. Fasten off. Work same as First Ruffle Section through row 5. Row 6: Hold row 9 of first ruffle in front of 2nd ruffle; ch 1, working through both pieces at same time, sc in each st, turn. Row 6: Hold row 9 of 2nd ruffle in front of 3rd ruffle; ch 1, working through both pieces at same time, sc in each st, turn. Row 6: Hold row 9 of 3rd ruffle in front of 4th ruffle piece; ch 1, working through both pieces at same time, sc in each st, turn. Row 7: SL st in first 5 sc; ch 3, dc in next 17 dc, turn, leaving rem sts unworked. Row 8: Ch 3, dc in each rem dc and in 3rd ch of beg ch-3, turn. Row 9: Ch 3, dc in each rem dc and in 3rd ch of turning ch-3. With tapestry needle and matching yarn, sew side seams of front and back, leaving side edges of ruffles unsewn. Sew side edges of each ruffle. Hold one ruffle with rs facing you and beg ch at top; with smaller hook, join black in seam joining; ch 1, working around ruffle in unused lps of beg ch, *sc in next 2 lps, ch 3 sl st in 3rd ch from hook; rep from around; join in first sc. Rep edging on each rem ruffle. With sewing needle and thread, sew last row of front and back over edges of purse handles.